This requires first that you download and install the latest driver from our website. default audio device listed inside of the software. Pro Tip: If the currently selected audio device has exactly two outputs (as with the builtin audio card in a Mac), Capture goes into Stereo mode. While in Stereo mode, Capture connects all tracks to the stereo output and adjusts the volume of the output automatically to account for stereo summing. Stereo mode enables you to listen to Sessions while away from your StudioLive. 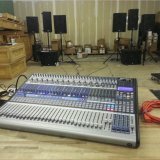 Unless the StudioLive’s driver is selected, you cannot create a new Session or record new audio. This problem can be corrected in two ways. 1. 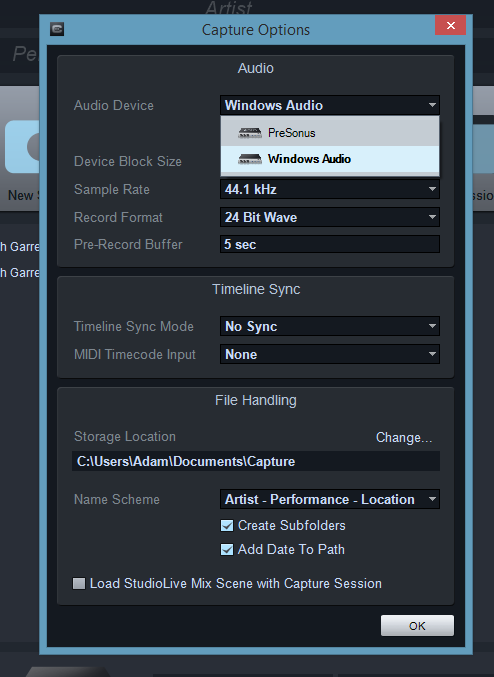 Go to the list at the bottom of the start page in the center of the Capture software and select the "Presonus" device. 2. Click on "Options" >> Select the Audio Device from the list here.